A new booklet with straightforward information on the development of Thames Streets. 68 Page soft cover, A4 booklet with photos throughout and colour as per available image. Published Feb 2016. 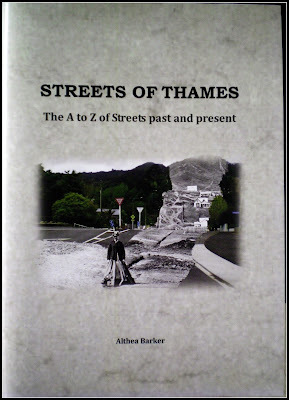 Covers an A to Z of Thames Streets from the goldfield opening August 1867 to present day for Thames. Includes history, maps and resource suggestions for researching Thamesites who lived at Thames. Includes pathways and steps around the town. Basic info designed to give you a starting point when researching your Thames families, or just someone interested in the development of a town. Available on Trademe Auction site.